The northern Chinese city of Harbin was largely shut down Monday by a thick blanket of smog, underscoring China’s recurring battles with air pollution as it tries to keep its massive population warm, connected and employed. Concern about air pollution has grown sharply in recent years, according to a Pew Research Center survey from this past spring. 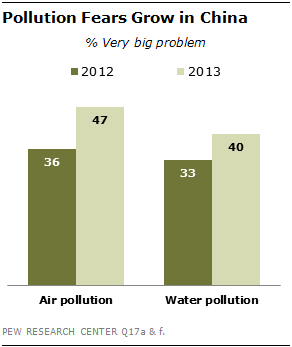 In that survey, 47% of Chinese said air pollution was a “very big” problem facing the country, up from 31% in 2008 and 36% last year. Air pollution ranked fourth out of 15 issues in terms of public concern, behind rising prices (which 59% of people cited as a very big problem), corrupt officials (53%) and the gap between rich and poor (52%). Harbin isn’t alone in struggling with air pollution. Monday’s PM2.5 level was 115 in Beijing, 85 in Guangzhou and 47 in Shanghai, according to China Air Daily (a project of the New York-based Asia Society’s Center on U.S.-China Relations). In contrast, the PM2.5 reading was 9.8 in New York and 10.8 in Phoenix.